Note: Kunihiro oysters are here but Kuriya has closed. Kunihiro oysters: large, plump and juicy here, raw on the half shell. Soon we can look forward to more of these in Singapore restaurants. 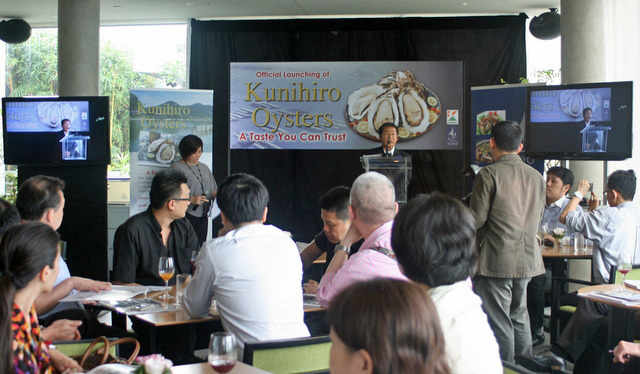 Kunihiro Inc., the largest producer of oysters in Japan, has appointed Toyo International Trading as sole distributor here. Mr Ikuzo Kawasaki, President of Kunihiro Inc., was in town to speak to partners and media at the launch held at Kuriya Penthouse. He gave an overview of how the company started and the painstaking process they employ to process fresh oysters cultivated in the sea. The oysters go through a series of advanced inspections (e.g. high-performance liquid chromatography) and tests to ensure optimum safety and freshness. The oysters for raw consumption are purified with alkaline electrolysed water to kill bacteria, remove surface dirt and offensive smells. Separate oysters are grown, harvested and frozen for cooking. According to Kawasaki-san, what sets Kunihiro oysters apart from others in the market is the longer cultivation period: 1.5 to 2 years. This results in bigger and fleshier oysters, which is important, because when you cook oysters, they tend to shrink. We got to see several ways the oysters can be prepared, both raw and cooked. 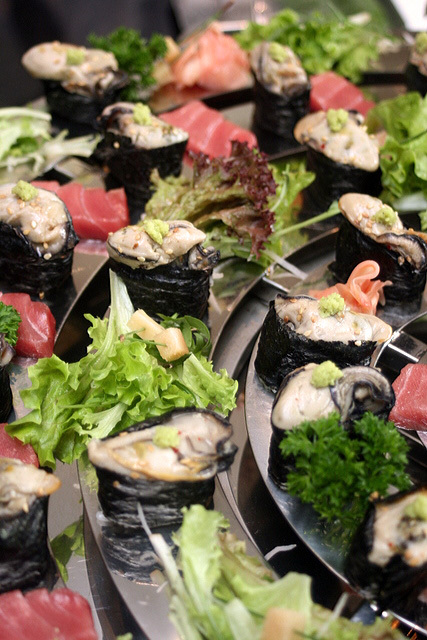 There are frozen ones that can be thawed to be used in sushi or sashimi-style. 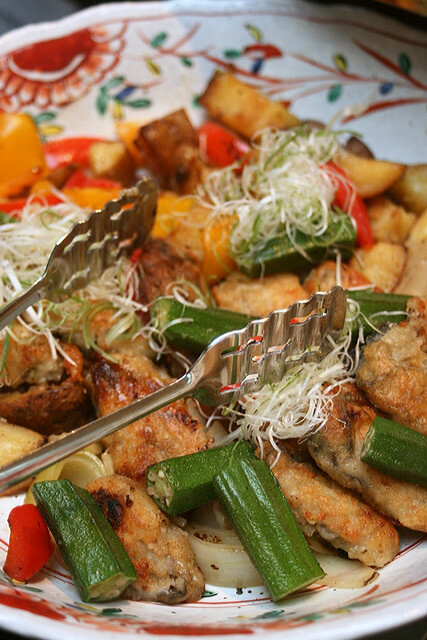 These oysters are battered, fried, and then sauteed with assorted vegetables. 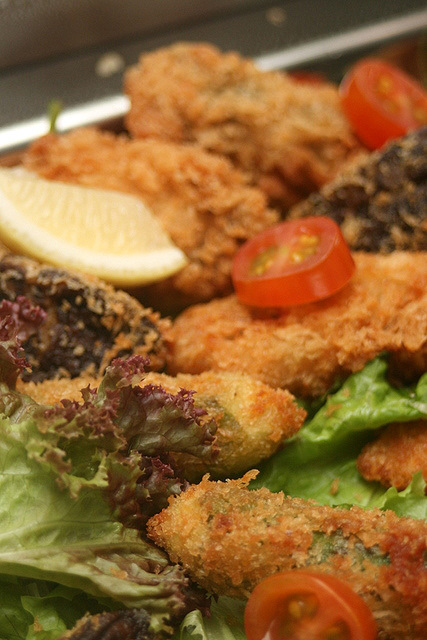 Kaki furai - breaded fried oysters - another popular choice. 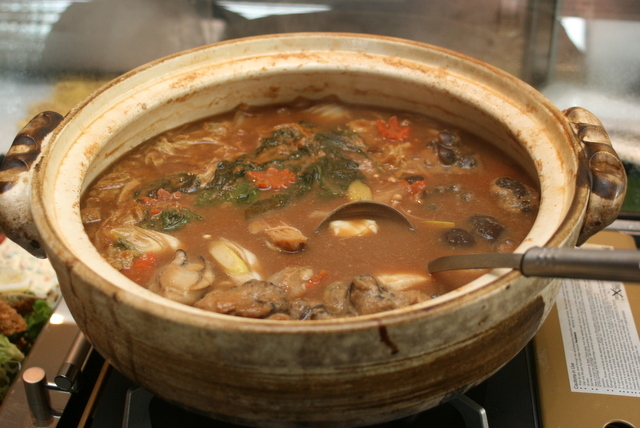 Claypot rice with oyster - the scent of the oysters gently perfume the rice. 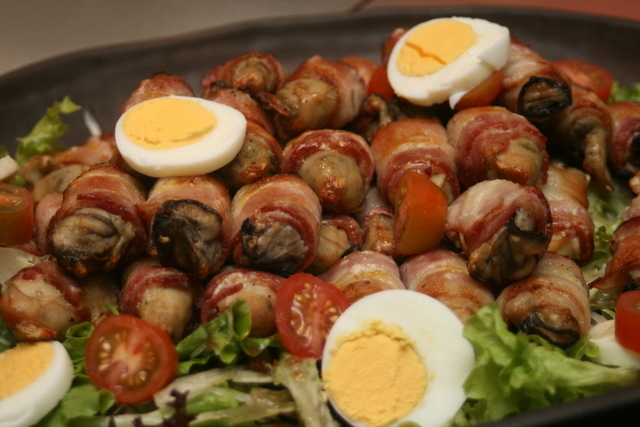 Oysters rolled in bacon, like pigs in blankets. Two indulgences in one. Oyster Hot Pot. A rich broth with cabbage, carrots and mushrooms. So here you have a medley of oysters done different styles. Personally, I still feel oysters are best enjoyed raw on the shell! 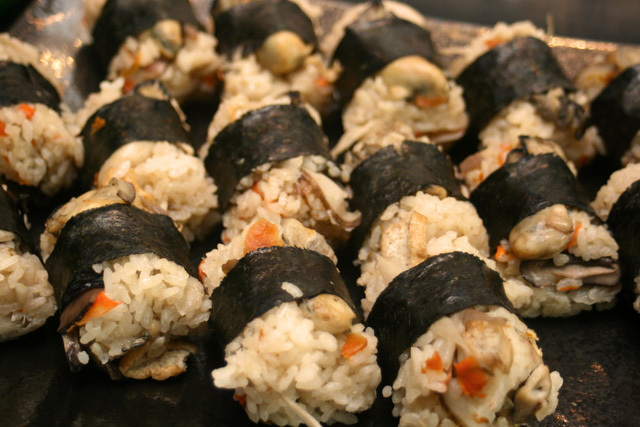 There are more recipes on the website (in Japanese, but you can run it through a translator). 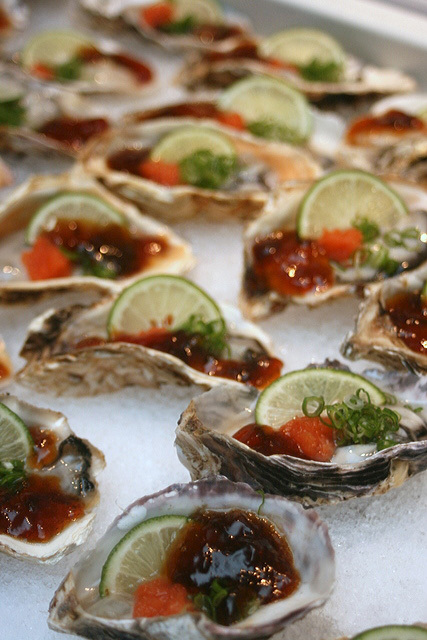 The Kunihiro oysters are indeed very clean-tasting and smooth, without any "fishy" smell. 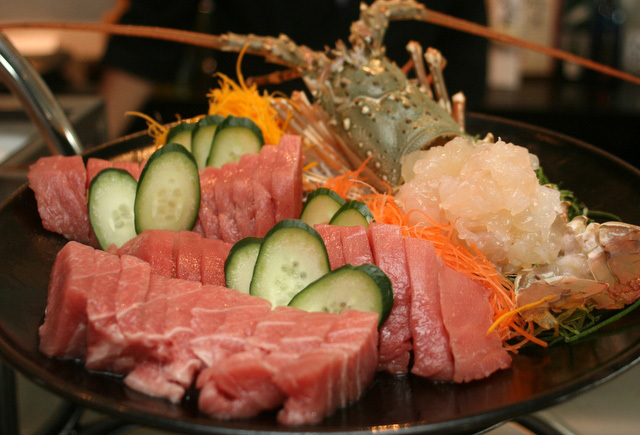 Along with the oysters, Kuriya Penthouse served some phenomenal sashimi - toro and lobster. So firm, fresh and sweet. We were all swooning. I was also honoured to meet the highly spirited Master Chef and General Manager Yoshihiko Koezuka, and even more so to hear that he reads and likes this blog. Wow! This is the chef who once served the Emperor and Empress of Japan! I had better improve my blogging! Anyway, do look out for Kuriya's fugu promotion in December and January. From what we saw today, I'll definitely be back at the Penthouse flagship outlet to try some of their dishes. And yes, more oysters is always good news. Oysters and Bacon? haha...thats a first for me. How did that go? Kenny: Yeah, I want some more too! KKGirl: anything with bacon is win! Hmm so can we buy these in supermarkets? Or only dine at Kuriya? 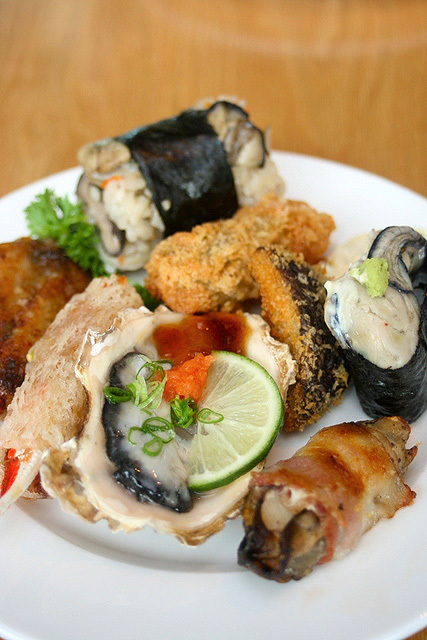 The 'claypot rice with oysters' sushi looks really inviting!